Spyro put in an appearance at this year's Comic-Con at the San Diego Convention Center. You can see the poster for the game at GoNintendo (or the at the original place ComingSoon.net) and in the background of this IGN photo from the event without the flash of the first. He obviously also made an appearance in video form, whether that was playable or not isn't so clear though at this point. Either way, The Legend of Spyro: A New Beginning finally appears to have a logo. Thanks go to GnastyRatchet again for finding the GoNintendo article. Vooks.net have an interview with John Welsh of Krome Studios. The interview clears up a few things and rules out multiplayer from The Legend of Spyro: A New Beginning. Will the game feature any multiplayer elements, if so what are they? No, the core of the game has always been delivering an exceptionally fun single player experience so it definitely felt to stick to and enhance upon that experience. The focus has and will always be on Spyro and his own experience as he learns who he is, what he can do and what he has to do. Also included with the interview are a few new screenshots. Thanks go to GnastyRatchet for finding the interview. GameSpot provide the first The Legend of Spyro: A New Beginning video. With a length of 1m35s the gameplay video shows Spyro fighting various different enemies using his melee and breath attacks. Seen throughout the video is a light following Spyro from a short distance away, so although Sparx isn't the health meter in the game he still appears to be following Spyro around nevertheless. And near the end you also see Spyro flying, apparently being chased as he dodges missiles flying past him. The chaser is unseen but it's likely to be Cynder as mentioned in the pre-show previews. GameSpot has a press release from Sierra Entertainment detailing the hollywood voice-over cast, previously it was unknown who they each played. This epic story of Spyro's quest to discover his roots and realize his destiny is amazingly brought to life by leading Hollywood voice-over cast members Elijah Wood (Frodo Baggins in The Lord of the Rings trilogy) as the new voice of Spyro; David Spade (The Benchwarmers) as Spyro's sidekick Sparx the dragonfly; and Gary Oldman (Sirius Black from the Harry Potter films) as Ignitus, the Fire Dragon Elder and Spyro's mentor. Again, the game is confirmed as set for release in October. TeamXbox bring the first eight images of the new game The Legend of Spyro: A New Beginning to the public. 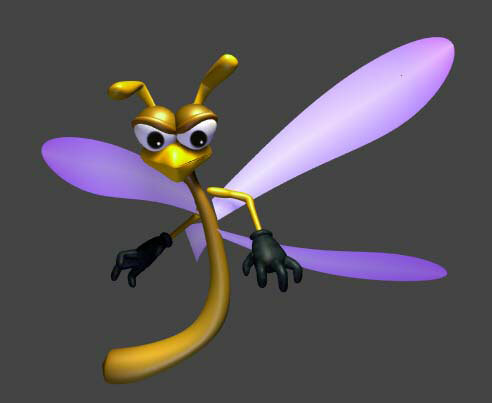 It seems like Krome Studios are the developers this time around and that they will probably be ignoring the Japanese Spyro origins by having Spyro raised by a family of dragonflies for some reason. It does seem however that Spyro will be back in the flying seat instead of Sgt Byrd who took over for A Hero's Tail. Thanks go to Mozepy for finding the article. The game is also mentioned in a GameSpot news article and also a GameSpot E3 pre-show first look. And the same press release as on TeamXbox. No images on GameSpot just yet though. They also confirm Krome Studios as the developers for all but a DS version, that one they say is by Amaze Entertainment again. Also, Vivendi now have a proper page with a rather bland looking logo as well as five screens of the game, four of them not on TeamXbox. And IGN now also have an article about the game, but there's nothing new there. VUGames now have a page for the new game, The Legend of Spyro: A New Beginning, which has some info about the game but unfortunately no pictures or screenshots yet. Level Up to Feel the True Power of the Purple Dragon! The Legend of Spyro shifts in game design and now focuses on action/combat and character growth/customization. Unleash devastating fury attacks, new melee and aerial combo attacks or use one of Spyro's many new breath abilities to defeat foes. Feel the power of the purple dragon as players have the control to upgrade Spyro's breath attacks and moves to their liking. It's a new beginning with a storyline that will serve as a prequel to all of the existing Spyro titles, the narrative will explore Spyro's origin for the 1st time and the game includes AAA voice talent from Elijah Wood, David Spade and Gary Oldman. Whilst the VUGames website only has a page for a PlayStation 2 version, according to the game's ESRB entry the game will appear on GameCube, PlayStation 2 and the Xbox. Incidently the game is rated 'Everyone 10+ (Cartoon Violence)'. It seems like the new Spyro game may have a name at last. Due for release on GBA, PS2, DS, GC and Xbox on the 13th of October 2006, Spyro: Legend is apparently the next game in the Spyro series. And again the game appears to be being developed by yet another new company to the series, this time it's Havas Interactive. This information was found at Gamesarefun.com and emailed to me by Jon. Also on the find list is a new Crash Bandicoot game, Crash: Boom Bang on the DS due for release at the same time. I'd say that whether the game will actually get released on all the consoles mentioned is questionable; it's a lot of different versions to manage. A new mobile Spyro game has been released, again made by Kaolink, it features Spyro going around rescuing a few dragon elders from the Shadow Realm. VUGames have recently added a trailer to their Shadow Legacy section which shows the game's fighting, both with the small creatures in the game and the larger one that has appeared in several screenshots. It also shows the touch-screen features of the game with attacks being made after drawing a certain shape. Thanks to Captain Spyro for finding this one. IGN has it as well as a short preview. They also have some screens that you may have missed if you didn't read the comments for the previous news post. Cheers Mozepy and Neal. And Shadow Legacy, it is. Vivendi have finally officially announced the game Spyro: Shadow Legacy for the Nintendo DS, though Amaze Entertainment are the people actually responsible for developing the game. Shadow Legacy will take use of the DS's touchscreen by way of inputting spells which are shapes and symbols. The second screen is shows the actual view of Spyro moving around. Wireless also plays a part too allowing you to trade collectable creatures. The game will also feature a levelling system, the more enemies you defeat, the more skill points you get to put to Spyro's strength and abilities, you'll also be able to put your experience towards building Spyro's collection of magical powers and martial arts combat abilities. The game also reportedly focuses a lot more on the story and development of characters then any previous Spyro game. See more screens by clicking here to get to the Nintendo page for Shadow Legacy. Storyline from Nintendo. Also thanks to Mozepy for finding the IGN, MyGame and GameSpot articles. In other news, I've finally finished adding the pictures to the Spyro the Dragon walkthrough and altered the Character Guide a little as well as finishing off another page of dragon profiles from Spyro the Dragon. Unfortunately this will be the last content update until the end of June, due to other commitments. Hope to bring you more Shadow Legacy news before then though.